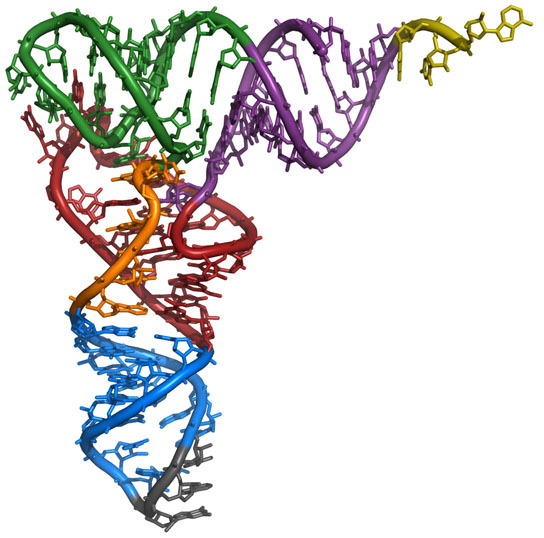 X-ray structure of a tRNA molecule found in yeast. A new study from biological engineers at MIT looks at how cells alter their chemical modification of molecules, known as transfer RNA (tRNA), to survive when treated with poisons, finding that toxic stresses reprogram the tRNA modifications to turn on a system that diverts the cell’s protein-building machinery away from its routine activities to emergency action. Toxic chemicals wreak havoc on cells, damaging DNA and other critical molecules. A new study from researchers at MIT and the University at Albany reveals how a molecular emergency-response system shifts the cell into damage-control mode and helps it survive such attacks by rapidly producing proteins that counteract the harm. Peter Dedon, a professor of biological engineering at MIT, and colleagues had previously shown that cells treated with poisons such as arsenic alter their chemical modification of molecules known as transfer RNA (tRNA), which deliver protein building blocks within a cell. In their new paper, appearing in the July 3 issue of Nature Communications, the research team delved into how these modifications help cells survive. The researchers found that toxic stresses reprogram the tRNA modifications to turn on a system that diverts the cell’s protein-building machinery away from its routine activities to emergency action. “In the end, a stepwise mechanism leads to selective expression of proteins that you need to survive,” says Dedon, senior author of the Nature Communications paper. The findings offer insight into not only cells’ response to toxins, but also their reactions to all kinds of stimuli, such as nutrients or hormones, Dedon says. “We’re proposing that any time there’s a stimulus, you’re going to have a reprogramming [of tRNA] that causes selective translation of proteins you need for the next step in whatever you’re going to do,” he says. Lead author of the paper is recent MIT PhD recipient Clement Chan. Other MIT authors are postdocs Yan Ling Joy Pang and Wenjun Deng and research scientist Ramesh Indrakanti. Authors from the University at Albany are Thomas Begley, an associate professor of nanobioscience, and research scientist Madhu Dyavaiah. Transfer RNA is made of 70 to 90 ribonucleotide building blocks. After synthesis, the ribonucleotides usually undergo dozens of chemical modifications that alter their structure and function. The primary job of tRNA is to bring amino acids to the ribosomes, which string them together to make proteins. In a 2010 paper, Dedon and colleagues exposed yeast cells to different toxic chemicals, including hydrogen peroxide, bleach and arsenic. In each case, the cells responded by uniquely reprogramming the location and amount of each tRNA modification. If the cells lost the ability to reprogram the modifications, they were much less likely to survive the toxic attack. In the new study, the researchers focused on a particular tRNA modification, known as m5C, which occurs when cells encounter hydrogen peroxide, a chemical produced by white blood cells. They first discovered that this modification occurs predominantly in one of the tRNAs that carry the amino acid leucine. Every amino acid is encoded by three-letter sequences in the genome called codons. Each tRNA corresponds to one amino acid, but most amino acids can be coded by several tRNA sequences. For example, leucine can be coded by six different genome sequences: TTA, TTG, CTT, CTC, CTA and CTG. The information in the gene sequences is carried to ribosomes in the form of messenger RNA (mRNA). At the ribosome, tRNA molecules pair with the appropriate mRNA codons, and their amino acids are added to the protein. The researchers found that m5C modifications attach to the first letter of the leucine tRNA sequence that pairs with the TTG codon, which makes that tRNA bind more strongly to ribosomes. They then scoured the yeast genome for genes in which most of the leucine codons consist of TTG. They found that of the 6,000 genes in yeast, about 40 have more than 90 percent of their leucines coded by TTG. Half of these turned out to be proteins that make up ribosomes. The researchers focused on a pair of ribosomal proteins known as RPL22A and RPL22B, which can substitute for each other, slightly altering the ribosome’s activity. RPL22A has 100 percent of its leucines coded by TTG, while RPL22B has 40 percent coded by TTG. This means that when hydrogen peroxide is present, provoking an increase in m5C modification of the leucine tRNA that corresponds to the TTG codon, the cell produces much more of the RPL22A protein. Therefore, the cell’s ribosomes become predominantly made of RPL22A, and that type of ribosome preferentially assembles the proteins needed to respond to hydrogen peroxide damage. “You need this sort of emergency ribosome response to make the critical proteins,” Dedon says. Indeed, the researchers found that hydrogen peroxide increased many different types of proteins from TTG-enriched genes. The research also offers insight into how cells have successfully exploited the redundancy of the genetic code, Dedon says. While many scientists have uncovered ways in which chemical modifications of DNA and proteins alter cell behavior, it is only recently that they have begun discovering the large role RNA modification plays, says Chuan He, a professor of chemistry at the University of Chicago. “This paper is a wonderful piece of work that really shows that tRNA can have a dramatic impact on gene expression,” says He, who was not part of the research team. The research was funded by the National Institute of Environmental Health Sciences, the MIT Westaway Fund, a Merck-MIT Graduate Student Fellowship, and the Singapore-MIT Alliance for Research and Technology. Be the first to comment on "How tRNA Modifications Help Cells Survive Toxic Chemicals"